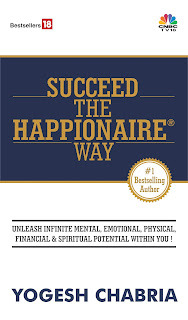 Yogesh Chabria - The Happionaire ​Blog - Best Motivational Speakers In India - Inspiration, Success: I Thank The Divine For Everything! I Thank The Divine For Everything! I would like to thank the Divine for everything. This life is a lovely gift from the Divine and I am grateful for each and everything. The lovely experiences, the wins and the losses. The successes and the failures (I must confess which have been many, but each has taught me a lot!) The good times and the challenging times. The people I have met in this journey till so far have all taught me something, most have been great, a few have been almost great - but each having a unique quality that makes this life interesting. They make this journey fun and exciting. Life has been beautiful, not just because of the good, but also because of all the times when I have thought - now what? What do I do next? Where do I go from here? And somehow, out of nowhere the Divine Force has come and guided me on this journey. When I look back everything that happened was good and for a reason. When I look back, I would have never imagined or expected for so many things to ever happen with me. There was a time when I would sell toys to other kids around me, there was a time, I would sell comics, there was a time when I would submit articles to all sorts of newspapers and journals, hoping to be published, there was a time when things were different, I am sure the Divine has planned something lovely for me and knows the best for me. I thank the Divine, from the bottom of my heart for giving me everything. I thank the Divine, for letting me share this message with each one of you. I am sure each one of you will be able to connect to this message at some level. It is not a prayer, it is much more it a conversation with the Divine. It is a conversation that is from the heart and from the soul. The Divine Force hears whatever comes form the heart and this is coming from deep within. Sometimes the most incredible feeling in the world is to simply open up and share what is in the heart. I thank the Divine for giving me a lovely family, friends, loved ones and everyone around me who helps me do what I do. Lots of love to each one of you and thanks for the lovely Birthday Wishes. Keep smiling and have a great time! The Divine - God Is Great Indeed! We should all thank him! At times when I look back I am surprised at the way life has taken its course and do sense/feel the presence of Divine hand. Hi, long time no blogs please do write to informs us what is going on at micro-macro.